A recent market study published by the company titled “Electrophysiology Ablation Market: Global Industry Analysis 2013-2017 & Forecast 2018-2026” consists of a comprehensive assessment of the most important dynamics of the electrophysiology ablation market. Upon conducting comprehensive research on the current growth parameters of the electrophysiology ablation market, the growth prospects of the market are obtained with maximum precision. The report features the unique and salient factors that are likely to have a significant impact on the development of the concerned market during the forecast period. It can help market players modify their manufacturing and marketing strategies to envisage the maximum growth in the concerned market in the upcoming years. The report provides detailed information about the current and future growth prospects of the concerned market in the most comprehensive manner for the better understanding of readers. The report commences with an executive summary of the electrophysiology ablation market report, which includes a summary of the key findings and key statistics of the market. It also includes the market value (US$ million) of the leading segments of the electrophysiology ablation market. Readers can find a detailed taxonomy and definition of electrophysiology ablation products in this chapter, which will help them understand the basic information about the concerned market. The definition section considers the factors included as well as excluded for the purpose of this report. This section of the report provides readers an outlook of the global electrophysiology ablation market, taking into consideration the various factors associated with the growth, which will help them track the current market scenario, with key inferences drawn from historical data, current trends and future prospects. This section also consists of an opportunity analysis conducted by FMR. Forecast factors and assumptions set for the estimation of the entire concerned market are also present in this section. Readers can find various macro-economic factors associated with the growth of the market. This chapter highlights the key market dynamics, which include the drivers, restraints and trends. In this chapter, readers can understand the factors that are propelling the growth of the market along with the factors that are likely to deter the growth of the market. Moreover, readers will understand the key trends followed by the leading manufacturers in the electrophysiology ablation market. Key pointers, such as patient journey, reimbursements scenario and electrophysiology sector M&A activity, are also included in the report. This section highlights the prices of different electrophysiology ablation products in different regions, the overall global market value (US$ Mn), forecast and analysis. Based on the product type, the electrophysiology ablation market is segmented into ablation catheter, diagnostic catheter and access devices. Based on the application, the electrophysiology ablation market is segmented into Supraventricular Tachycardia (SVT) ablation, Ventricular Tachycardia (VT/VPC) and Atrial Fibrillation (AF). Based on the end user, the electrophysiology ablation market is segmented into hospital, ambulatory surgical centre and clinic. This chapter includes a detailed analysis of the growth of the North America electrophysiology ablation market, along with a country-wise assessment that includes the U.S. and Canada. Readers can also find historical trends and market attractiveness based on the product type, application, end user and country of the North America region. This chapter includes a detailed analysis of the growth of the Latin America electrophysiology ablation market along with a country-wise assessment that includes Brazil and Mexico. Readers can also find historical trends and market attractiveness based on product type, application, end user and country of electrophysiology ablation in the Latin American region. Important growth prospects of the electrophysiology ablation market with market attractiveness based on product type, application and end user in several European countries, such as EU4, UK, Eastern Europe and the Rest of Europe, are included in this chapter. This chapter includes a detailed analysis of the CIS & Russia electrophysiology ablation market. Readers can also find market attractiveness based on product type, application, end user and country of the electrophysiology ablation market in the CIS & Russia region along with the market value. India, ASEAN and China are the leading countries in the APEJ region that are the prime subject of assessment to obtain growth prospects for the APEJ electrophysiology ablation. In this chapter, readers can find detailed information about the growth parameters. Readers can find important factors that can have a significant impact on the growth of the electrophysiology ablation market in Japan based on the market segmentation during the forecast period. This chapter provides information about how the electrophysiology ablation market will grow in the major countries in the MEA region, such as GCC Countries and South Africa, during the period 2013-2026. This chapter includes the market structure by tier of companies for the electrophysiology ablation market. This chapter also includes the company share analysis for various key players in the market. In this chapter, readers can find a comprehensive list of all the leading stakeholders in the electrophysiology ablation market, along with detailed information about each company, including company overview, revenue shares, strategic overview and recent company developments. Market players featured in this report include Biosense Webster, Abbott Laboratories, MEDTRONIC PLC, Boston Scientific Corporation, CathRx Ltd., Biotronik SE & Co. KG., Japan Lifeline Co., ATRICURE, INC., Auris Health and Biomerics. This section consists of a glossary of assumptions and acronyms used in the electrophysiology ablation market report. This chapter helps readers understand the research methodology followed to obtain various conclusions, important qualitative information and quantitative information about the electrophysiology ablation market. The electrophysiology ablation market has observed substantial progress over the past few years. Ongoing research will create the landscape for further product innovation in the electrophysiological ablation market. Market leaders are focusing on sustaining premium segment leadership in the electrophysiology ablation market. 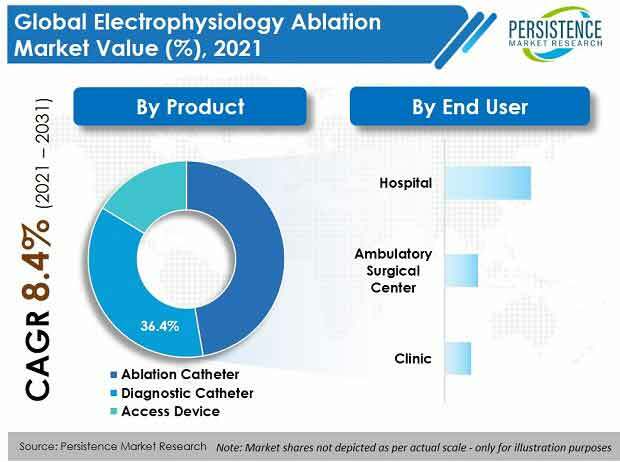 As the general electrophysiology ablation market is consolidated in terms of electrophysiology ablation catheters, market leaders are focusing on expanding their product portfolios to strengthen their customer insight capabilities on a global level. Electrophysiology ablation has grown into an effective treatment option for indicative, drug-resistant atrial fibrillation (AF), and has lately been implemented as a first line of treatment for patients with paroxysmal atrial fibrillation. The usage pattern for antiarrhythmic drugs, which witnessed a shift due to the emergence of clear-cut electrophysiology ablation procedures, has made a huge impact on sales, which, in turn, has been affecting the overall revenue generated from the antiarrhythmic drug market. Electrophysiology ablation is expected to gain popularity, as it provides great benefits for the patient, with reduced side-effects and optimum results. The electrophysiology ablation market is largely consolidated and dominated by the global manufactures of such products. The consolidated nature of the market and the accessibility of reasonable products decrease the profitability of the business in the concerned market. However, the growing awareness about electrophysiology ablation and the growing demand for cost-effective diagnostic options have increased revenue opportunities for global manufacturers. Companies such as Biosense Webster, Abbott Laboratories, MEDTRONIC PLC, and Boston Scientific Corporation, which together account for close to 90% revenue of the electrophysiology ablation market. These companies have dominated the market for a long time now. Their main priority is the launch of novel product lines for the market. Further, companies operating in the electrophysiology ablation market are collaborating with local distributors/retailers to increase the penetration of their products. Most catheters used in electrophysiology ablation are for single use. The market for electrophysiology ablation is considered to be ruled by the big four companies present in cardiac care. However, with new companies emerging in the industry, products that can revolutionize the product scope can be expected. CathRx launched the first ‘reposable’ diagnostic and therapeutic catheter for the treatment of cardiac arrhythmias, which is a niche product in the electrophysiology ablation market. Atrial fibrillation (AF) is a type of arrhythmic condition where the heart function gets disrupted by abnormal beating through electrical signals in no particular order. The AF condition can be for a shorter duration as well as for a longer time, and both require effective treatment, which is ablation in most cases. The significant rise in the number of cases of AF makes it the most prominent application segment for the procedure of electrophysiology ablation. AF treatments account for a substantial percentage of the NHS budget in the U.K. The U.S. market also shows a high number of reported AF cases, with projections showing a rise in the coming years. AF is not the only factor having some effect over the market. Conditions that are associated with AF also push the market, as early treatment is suggested. The electrophysiology ablation market is highly driven by this macro trend. The report on the electrophysiology ablation market details information on the growth parameters of electrophysiology ablation companies. The study encompasses comprehensive data on each stakeholder, including Biosense Webster, Abbott Laboratories, MEDTRONIC PLC, CathRx Ltd, Biotronik SE & Co. KG., Japan Lifeline Co., Boston Scientific Corporation, Auris Health, ATRICURE, INC., and Biomerics. Details in the electrophysiology ablation market report include market revenue shares of product manufacturers, and latest information on key strategies in the concerned market, apart from many other fundamental dynamics. The electrophysiology ablation market study provides comprehensive information about the most important market dynamics that prove instrumental in the growth of the EP market during 2018-2026. Market players can find the most accurate dynamics, including both, quantitative and qualitative information about the growth parameters of other electrophysiology ablation catheter and access device manufacturers, which is expected to aid the development of data-driven business strategies over the forecast period. The electrophysiology ablation market is segmented as per geography, product type, application, and end user, to analyze the segment-wise revenue growth of the electrophysiology ablation market. Based on geography, the market is segmented into seven regions – North America, Europe, CIS & Russia, Latin America, Asia Pacific Excluding Japan (APEJ), Japan, and the Middle East & Africa (MEA). The electrophysiology ablation market is segmented into product type - ablation catheters, diagnostic catheters, and access devices. By application, the electrophysiology ablation market is segmented as supraventricular tachycardia (SVT) ablation, ventricular tachycardia (VT/VPC), and atrial fibrillation (AF). By end user, the electrophysiology ablation market is segmented into hospitals, ambulatory surgical centers, and clinics. Which EP product type accounts for the maximum demand in the concerned market? Why is it so? Why are the sales of EP products the highest in developed markets? Which factors are influencing the competitive strategies of players in the market? What strategies are being applied by EP product manufacturers in order to sustain themselves in the competitive market? The process of market research followed at the company commences with extensive secondary research of the electrophysiology ablation market. Analysts obtain industry-validated, historic, and current data about the demand for electrophysiology ablation across the globe. Comprehensive secondary research is followed by extensive and in-depth primary research, where detailed information about the electrophysiology ablation market is obtained in terms of value (US$ Million). Based on thorough secondary and primary research of the growth parameters of the electrophysiology ablation market, analysts come up with the most precise forecast on how the electrophysiology ablation market will grow during the forecast period. Biotronik SE & Co. KG.